Blog / Moore Brothers Leverage 5 Axis Machining with VisualCAM for SOLIDWORKS! Moore Brothers Leverage 5 Axis Machining with VisualCAM for SOLIDWORKS! Moore Brothers Company of Warren, RI (USA) is a growing startup owned and operated by brothers Oliver and Samuel Moore. The brothers keep their 5 Axis ShopBot® CNC machining center busy with G-Code generated by VisualCAM MILL for SOLIDWORKS. 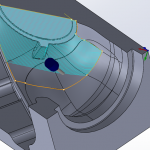 VisualCAM supports both continuous and indexed 5 Axis machining directly within SOLIDWORKS. 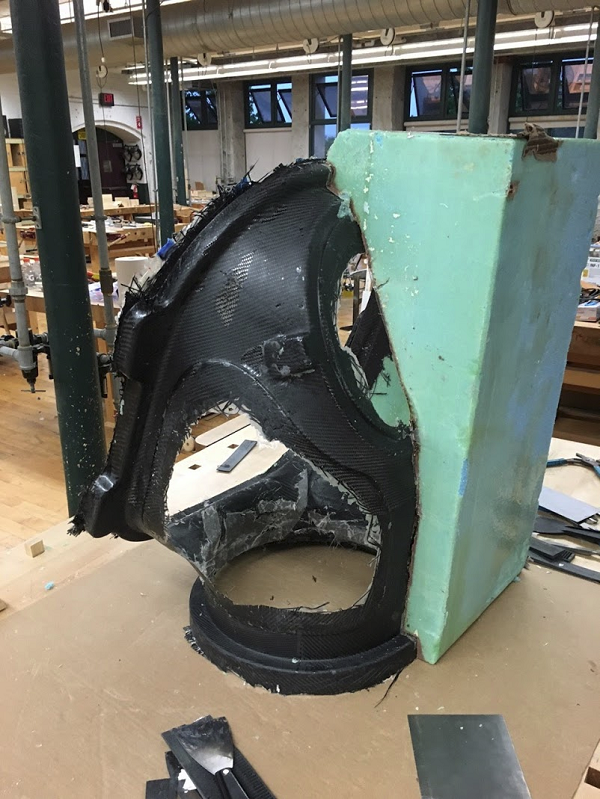 In the example shown below, indexed 5 Axis machining (also referred to as 3+2 machining) is used to cut a one cavity foam mold of a spacesuit costume component. In indexed 5 Axis machining, a Machine Coordinate System (MCS) is defined in ANY 3D orientation. Note the multiple setups under the Machining Job on the left. While the spindle is “indexed” to this setup orientation, multiple 2½ & 3 Axis operations are performed. The cutter remains oriented to the setup coordinate system while following the part’s surface contours. VisualCAM for SOLIDWORKS is shown simulating an Indexed 5 Axis operation. 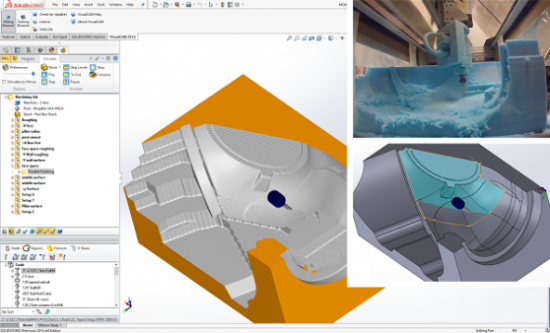 The VisualCAM Machining Browser is shown on the left as an additional tab in the SolidWorks Feature Manager (Inset Top) The in-process stock is being cut on the table of the ShopBot 5 Axis CNC center. (Inset Bottom) The VisualCAM toolpath, cutter and tool holder is shown on the selected drive surfaces of the SOLIDWORKS part. Note the orientation of the MCS triad located on the top-right corner of the part. The axis of the cutter remains parallel to the Z axis of the MCS. Courtesy of Moore Brothers Company, Warren RI. For more information about brothers Oliver and Samuel Moore and Moore Brothers Company, we recommend you visit them on their Facebook page.